GMade Skid Plate for R1 Axle Discounts Apply ! GMA51122S - GMade Skid Plate for R1 Axle. CNC machined aircraft aluminumwith silver anodizing finish. Skid plate will protect the axle from rocks and debris. Fits Gmade R1 Axle. 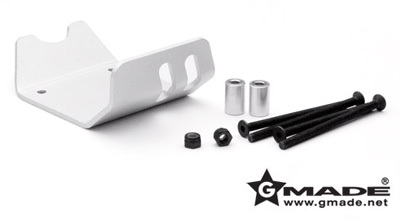 What's included: Skid plate x 1, 11mm spacer x 2, Installation Screws & Nuts. Note: For font and rear axles, you will need 2 of this product. Made for the Gmade R1 rock crawler.